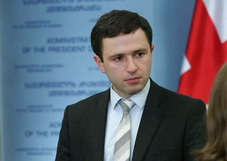 Majority MP Gia Vollski called on the President of Georgia, Giorgi Margvelashvili, not to veto a bill on the Constitutional Court, which increases the quorum required for the Constitutional Court to decide cases. According to Volski, the majority made a rational and not a political decision, and if the President vetoes the bill, the majority is ready to override it. “There are areas where rational decisions are needed, rather than a political decision. We made a rational decision and I think that the President should understand that," Volsky stated. If the President decides to veto the bill, at least 76 votes of the MP’s are needed to override it. A controversial bill was passed by the Parliament by 81 votes on May 13 with its second reading and it envisages, among other issues, increasing the quorum required for the Court to decide cases. The bill was proposed by the ruling Georgian Dream party and it was not approved by the United National Movement (UNM) parliamentary minority group, which accused the governing party of an attempt to take control over the Constitutional Court. MPs from the Republican Party, which formally remains within the GD parliamentary majority group until the October parliamentary elections, as well as lawmakers from the Free Democrats opposition party were also against the motion. The President’s Advisor for Human Rights Issues, Kakha Kozhoridze, responded to the statement made by Gia Vollski. According to him, a veto is a normal act, constitutional procedure, through which the President communicates his remarks to the Parliament. “MP Volski's statement indicates that the essence of the veto is not properly perceived and it is still regarded as a declaration of political confrontation,” Kozhoridze said. Along with a higher quorum for taking decision, the bill on Constitutional Court also proposes to increase number of judges required to be present when the Constitutional Court sits as a full bench when discussing a case. The bill also changes to rule of nominating and electing Chairperson of the Constitutional Court. According to existing laws, the Chair of Constitutional Court is selected through consultations between the President, Parliament Speaker and Chairperson of the Supreme Court. The new law means the Chair should be selected by the Constitutional Court judges and elected with support of at least five members. The majority says the new bill will strengthen independency of the Constitutional Court. They were going to send the bill to the Venice Commission before its adoption. However, now they say they will send it when it is finally adopted.